Are you looking for a super easy to implement classroom economy? Try Stickers! I had wanted to implement an economy rewards system in my classroom, but most ideas I found seemed like a lot of work to me. Like most teachers, my plate is overflowing already, so I wanted to make it simple. It finally hit me one day - stickers! 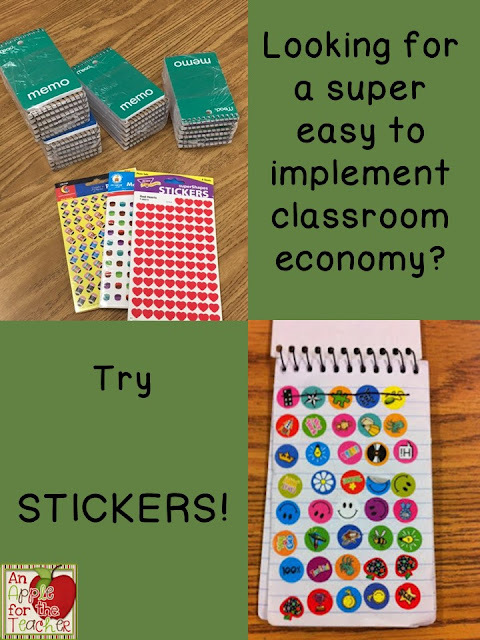 I LOVED getting stickers as a kid, but my kiddos love them even more because each one is worth $1 in our classroom economy. Whenever the student turns in an assignment, answers a "stretchy" question, or is "caught being good" I give them a sticker to put in their book. At the end of the month we have a mini-store with various prizes (books, pencils, erasers, etc.) and they can "spend" their stickers. I simply use a sharpie to cross them out as they spend them. 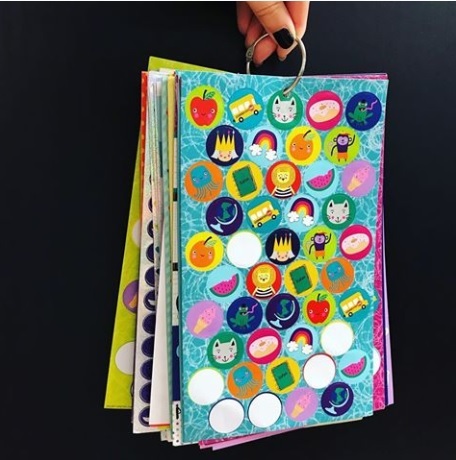 I love the way that MsKohlskids keeps her stickers on a binder ring! Have you used a sticker economy in your classroom? I'd love to see! Comment below or tag me on Twitter or Instagram. And while you are here, don't forget to enter our latest giveaways! Throughout the day when I have a few minutes to spare before recess or before dismissal, I pull out a book of Mad Libs. My kiddos love them and it is a great way to practice grammar skills. They BEG to do Mad Libs. To make it a bit more interactive for all, I ask the category and tell them all to think of an answer, and put their thumb up when they have one. I then pull a stick or randomly call on them to answer. They have gotten really good at explaining to each other what verbs, plural nouns, adverbs, adjectives, and nouns are. Have you ever tried Mad Libs? What other fun things do you do with those "extra pockets of time"? You probably know that Wal-Mart has some great low prices on items that teachers need in their classrooms, but did you know that they also realize just how much teachers pay out of their own pocket for these supplies? Realizing this, they give out tons of Wal-Mart gift cards to teachers in areas where their stores are located. Our school was chosen in the area I live in and they gave out 20 $50 gift cards plus extra box top certificates. I was lucky enough to win one of the gift cards! Now, they are also having a contest just for teachers! The Classrooms by Walmart Sweepstakes! From now until November 4, if you register for Classrooms by Wal-Mart wish lists, you'll be automatically entered into daily drawings to win a Walmart gift card! Dozens of teachers will win $50 gift cards, and two lucky teachers will win our grand prize - a $500 Walmart gift card! 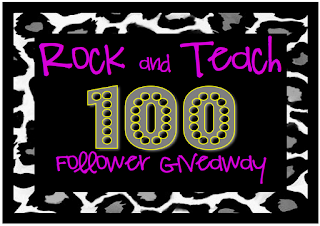 You can get extra entries by refering your teacher friends! In honor of the first weekend of fall, Second Grade Math Maniac is hosting a blog hop this weekend and I've decided to link up. Click Here to go to Second Grade Maniac's page! 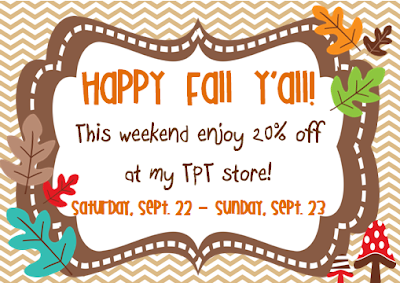 I have put all of my items on sale this weekend for 20% off! Click here to visit my store! We all have those great days in our teaching lives when we think, "THIS is the reason I became a teacher!" I had one of those days last week when I was working on a subtraction with regrouping lesson. I had about 6 kiddos who just couldn't get it, so we kept practicing and practicing. I finally made it down to one little guy who just was struggling. He was ready to give up, "I can't do this, I am stupid at math!" he told me. "You are not stupid at math - you are smart. You just need a little more practice and I will practice with you until we get you over this hurdle." I told him. Problem after problem we practiced until the spark hit him and he realized he could do it! Excited with his new ability he asked me to give him a harder problem. We went from two digits to three, three digits to four until he was subtracting in the millions and billions. Then we went to problems where he had to regroup more than once. He BEGGED to take the whiteboard out to recess to practice. My normally wiggly guy sat completely still during the entire 15 minutes solving problem after problem :) Then he asked if he could teach the class! Here is a subtraction with regrouping freebie for you! What great teaching moments have you had this week? Daily 5 is underway and going well in our classroom. We usually manage anywhere from four to six rounds each day. I use the time to individually conference with students in a CAFE style. I haven't been able to squeeze in many small groups, but I kind of like it that way being able to give the students individualized attention. I have three kiddos who are reading at a first grade level, so I meet with them daily. The rest I meet with anywhere between two and three times per week depending on their needs. I love seeing the kids engrossed in their books! So far I have been able to let them make their own choices, but I have a few squirrely ones who may need more teacher direction, or at least a log like this one. This one was made by Susan at Mrs. Gorbe's Kinderlittles. How has Daily 5 been going in your classroom? Yesterday our class had a special visitor! Yes - that is a baby snake. One of the boys in the class next door found this on the playground - then brought it into their pe class and freaked out the sub. I happened to be in the office when it was confiscated and asked if we could bring it into my classroom to share with my kiddos because they would love it! They had the best time checking it out and asking questions. The gentleman in the photo is the husband of our literacy coach who volunteered to find the snake a safer new home. In honor of our new snake friend, I thought you might like this The Day Jimmy's Boa Ate The Wash themed find someone who. 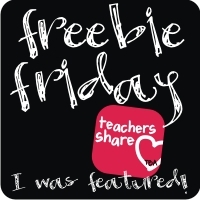 I am linking up with Freebie Friday at the Teaching Blog Addict! Be sure to visit for more freebies! My students and I both get bored with the same old think,pair,share or exit tickets for formative assessment, so I was excited to find this set of formative assessment task cards with a ton of ideas.There are over 80 different strategies and ideas to try! I have been lucky enough to always have a parent or two that would like to donate to my classroom. They often ask for wish lists during the book fair or during back to school night. Well, did you know that you could also set up a wish list with Wal-Mart? You can create a supply list for student supplies as well as a wish list for miscellaneous needs and wants. You can add the link to an email to your parents or on your class website. Who knows? Your wish list just might magically appear at your classroom door one day. Ever since one of my students brought in a tomato horn worm, my kiddos have been begging to do "Research" as one of their Daily 5 Choices. I love the idea that they are self-directing their learning and that they are seeking out informational non-fiction text (you know, one of those biggies in the New Common Core Standards). But... (and this is a big But) I am finding that a lot of my kiddos really love watching videos about their topic of choice. I am really ok with this, but these are some of the same kiddos who really need to work on their comprehension and writing skills. Luckily I stumbled across this 3-2-1 Reading Strategy Sheet from Teaching With Love and Laughter! I printed a ton of these off and have placed them next to my computer station for them to complete when they conduct their research. A win win for both teacher and student! I will probably also use this for reading informational text later on in the year as well. As part of our daily homework using WBT's Three Star Homework model, the students practice their math facts (currently multiplication) each night. 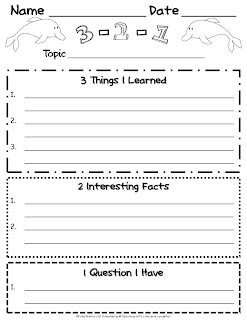 I just found these great self-grading timed quizzes from Fun4theBrain that I am going to let the parents know about for an extra way for them to practice their math facts. They can fill in their name, take the test, then print out the results. I might also have this as an activity during our weekly computer lab visit. If they don't pass a particular level, they can take it home to correct or complete. 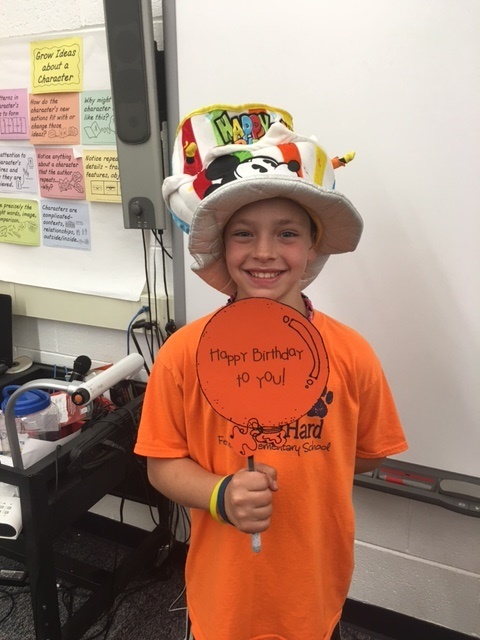 We have been celebrating birthdays like crazy in our classroom and it is only the third week of school! We have been blessed with a ton of September birthdays (I have a very young class) - we have had four birthdays already and we have two more this month! I only have 21 students, so it is amazing how many were September babies! On each child's birthday I force ask them to wear this crazy birthday hat that I had picked up on one of our family vacations at Disneyland. We then take their picture and sing to them. 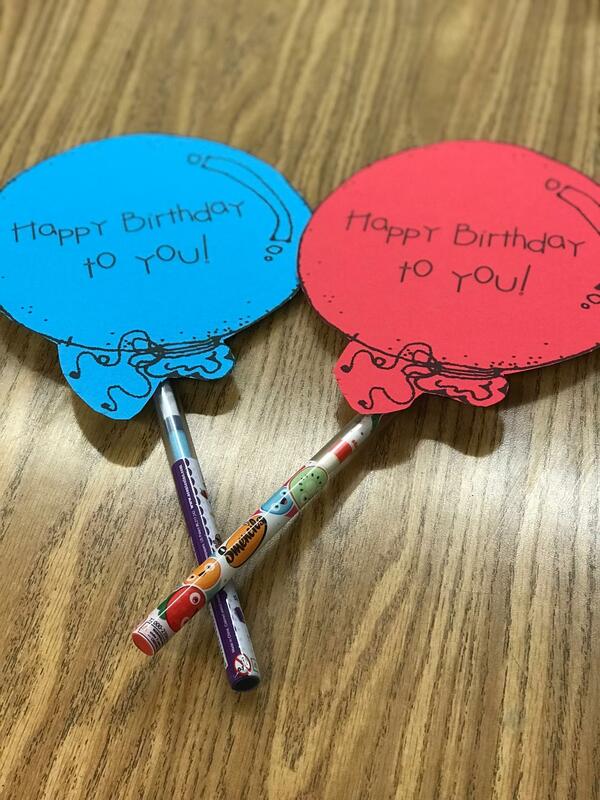 I also give them a Smencil attached to a birthday balloon template that I got here from What the Teacher Wants. My 7th graders loved the tradition, and my 3rd graders are loving it too! What do you do to celebrate birthdays in your classroom? One of the projects we worked on this week was a combination art and writing project. We used The Important Book by Margaret Wise Brown as our mentor text. We copied the predictable text with the first and last sentence being the same. The students used this pattern to write about themselves. We also did a tear art project which required the students tearing paper to make a picture of themselves. It was very tricky to not use scissors! Loving My New Classroom Name Sign from Hadar! This little beauty arrived in the mail the day of our Back to School Night and I couldn't have been more pleased! Hadar (a.k.a Miss Kindergarten) did an amazing job, and it perfectly matches my room decor! You will definitely want to stop by her Etsy store to see some of her other creations! I am linking up with Teaching Blog Addict's Open House Week! Monday: Meet the Teacher- tell us all about you and your teaching style! I teach 3rd grade in a rural town in Northern Nevada. This is my first year teaching third grade after making the jump down from 7th grade math. It has been quite the adjustment, but I am loving it so far! In addition to teaching my 20 classroom kiddos, I am also a mom to 6 boys ranging in ages from 6 to 19. My teaching style is very eclectic (for lack of a better word)! I love the individualized attention of Daily 5 and Cafe, but I also love the whole class methods of Whole Brain Teaching. I am not overly strict, and my students know that I love them to pieces. I prefer Love and Logic Methods to threats. 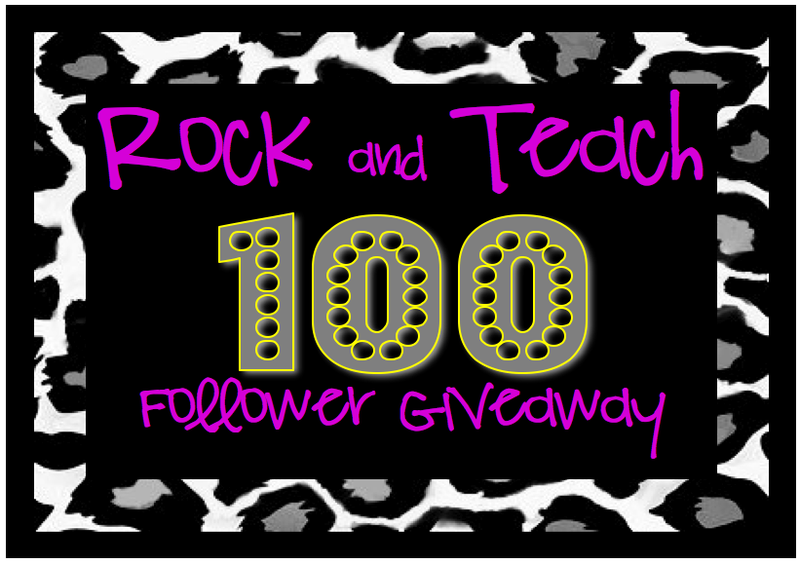 Giveaway Items include: $5 Starbucks Giftcard $5 Teachers Pay Teachers Gift Certificate $15 Target Giftcard. Who Knew That a Little Worm Could Bring About So Much Learning?? Today was one of those days when you have a perfectly good lesson plan written, and suddenly a great teaching moment lands in your lap, so you scrap your lesson plans and watch the students soar as learners. One of my students came in with his mom and a jar with what looked like a bunch of leaves in it. She told me that they had found this horn worm on their tomato plants, and decided to bring it in to share with the class. I planned on just having the student share his little "friend" during our sharing portion of our morning meeting, but I would have never guessed that my students would be so intrigued! They started asking a billion and one questions and even asked if we could do some research about the horn worm (which has a horn at it's bottom that gives it its name - we had quite the discussion deciding whether it was its head or its bottom, but when it started eating we knew the answer). The students spent some time writing down their observations and questions. Then they decided to do some research on the computers about the tomato horn worm. They checked out these two sites: VegEdge and Wikipedia. They also loved watching this video on youtube. We talked about how gardeners might not like these worms on their plants as much as we liked learning about them. It was amazing how many different ways the students responded to the hornworm in our classroom. Some of them approached their learning as artists, drawing pictures of the hornworm. Some of the students responded as scientists formulating a list of questions they could discover and research. This little guy lying on the carpet saw me with the camera and said, "Quick! Mrs. Malloy has the camera! Camouflage - blend in like the worm!" We wrapped up our fun-filled learning day by writing thank you letters to the student and his mom for bringing in the horn worm for us to learn about! All in all, this was one of my best teaching days ever- the kids were completely engaged from morning until afternoon (we actually worked past the bell and had to scramble to leave!). One of my older boys came into my class this day because he left his lunch at home and commented about how busy all of the students were. "It was a whirlwind of activity!" he said. I am linking up with Teaching Fourth for Fun Friday! Stop by and Link up!